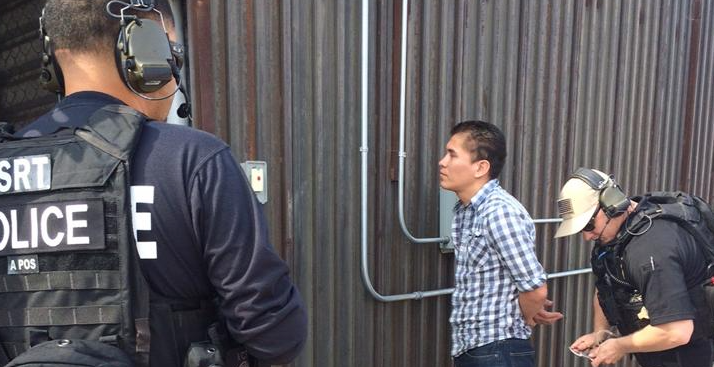 Home >> Featured >> Illegal Immigration and Crime: Another Mexican Murder Flees to the U.S. Illegal Immigration and Crime: Another Mexican Murder Flees to the U.S.
Jauregui-Rosales murdered a man in Mexico on Christmas Day in 2011 and entered the U.S., illegally, within days. Diego Oswaldo Jauregui-Rosales is another example of the truth that illegal immigration and crime go hand in hand. The question is, do you really think he instantly reformed his ways once he entered America? Or are you a realist and know that he continued his life of crime? The bottom line, either way, is that our government is not protecting its citizens when it allows foreign murderers to enter the U.S. unencumbered. SACRAMENTO, Calif. – A Mexican national captured recently in northern California, who is wanted for a fatal Christmas day shooting in Guadalajara four years ago, was turned over to Mexican law enforcement officials by U.S. Immigration and Customs Enforcement (ICE) Wednesday at the San Ysidro border crossing south of San Diego. Diego Oswaldo Jauregui-Rosales, 31, was transferred by ICE Enforcement and Removal Operations (ERO) officers to the custody of representatives from the Mexican Attorney General’s Office. An arrest warrant issued in March 2012 by authorities in Jalisco, Mexico, charges Jauregui-Rosales with one count of murder and two counts of attempted murder. According to the arrest warrant, the murder victim, Osvaldo Garcia Velazquez, was standing with two friends on a Guadalajara street corner Christmas morning in 2011 when the accused and two other men came up behind him. Witnesses say the three men drew weapons and began firing at Garcia and his companions. The murder victim attempted to flee, but he suffered a fatal bullet wound to the chest and collapsed nearby. Authorities now believe the suspect entered the U.S. illegally within days of the murder, but investigators here did not learn about his possible whereabouts in northern California until recently. FBI representatives based in Jalisco were alerted by Mexican authorities that the suspect might have sought refuge with relatives in Colusa County. The FBI relayed the information to Department of Homeland Security personnel in Sacramento who contacted ICE ERO. ERO, working in close collaboration with the U.S. Marshals Regional Fugitive Task Force, began following up on potential leads. On April 28, ERO officers and members of the Fugitive Task Force were conducting surveillance on a residence in Williams when they observed a man matching Jauregui-Rosales’ description come out, get into a vehicle and drive away. Task Force members and officers with the Williams Police Department stopped the car and took Jauregui-Rosales into custody without incident.